ONE CHILD An at-risk public elementary school child who needs a relationship with a caring adult. ONE HOUR Sixty critical minutes each week when a trained mentor befriends a child and helps him or her acquire basic academic skills. ONE CHURCH Takes ownership of a program with its neighborhood school and provides a trained mentor and a behind-the-scenes prayer partner for each child. ONE SCHOOL Welcomes this proven intervention to increase the academic skills of at-risk children, while incurring no additional expense. 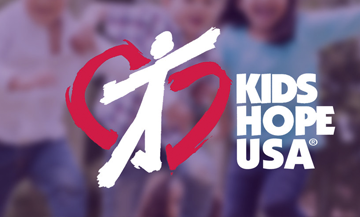 Check out the Kids Hope national website: www.kidshopeusa.org.